During this long, difficult, snowy and dreary Winter, Cropredy Lawn has dealt with three snow storms but until four weeks ago had somehow avoided the worst of the rain. My how have we made up for that in the last two weeks, as in recent days this farm has never looked so wet since Dad died and I took over in 1995. As pre-preparatory school children we had to endure extra ‘religious reading’, under the fierce instruction of the diminutive Miss Walsh in the dining room after tea, all through the Winter. Mum and Dad realised we’d vanish at that time of day during the Summer! Of course the most important parts were the life, teaching, death, resurrection and ascension of Jesus, but we always tried to side-track Miss Walsh back to Noah and his Ark, because of our concern about the animals! 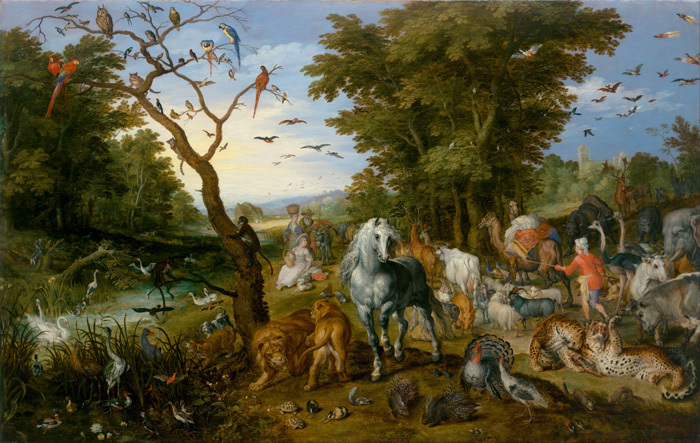 “The entry of the animals into Noah’s Ark” by Jan Bruegel the Elder. 1613. Without appearing blasphemous and in the full knowledge that we don’t seem to have the Gods grinning down on us at this moment, I do feel some empathy with Noah right now. I am trying to steer the good Ark ‘Cropredy Lawn’ through choppy and very deep waters. We have animals in here that are well-looked after and eager to race, but there is no dry land in sight. Unlike Noah in Genesis (Chapters 6-9), I have not received direct instructions for the construction of an Ark to safeguard his family, pairs of all animals and the entirety of Nature herself, so we do our best to survive through these flooded times. 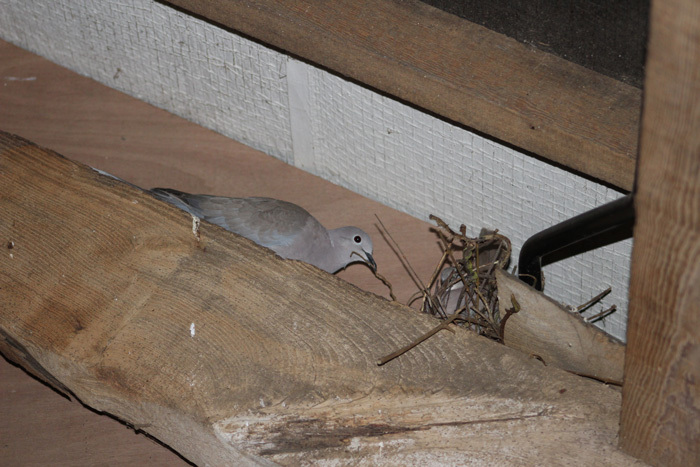 I was cheered by the arrival this week of a pair of doves who are nesting in Dassett Gold’s stable, especially as they have little branches in their beaks, so maybe the rains will abate shortly! Our Doves have arrived at last! Racecourse staff and Clerks of the Courses do tremendous work to battle through and keep racing going, but it is only a certain type of horse that can cope with these extreme conditions. Congratulations to all that prevail, but it seems that we just don’t have many horses that can cope with the current heavy ground. This is no ‘cop-out’ or lame excuse for quiet times, just the way it is. We admit to undertaking a tiny bit of handicapping with one or two but there is nothing to be gained by running debutantes on desperate ground, neither the horse nor ourselves learn anything and nobody enjoys the experience. I’m sure everybody has vivid, differing and long-lasting special memories from a remarkable Cheltenham Festival. 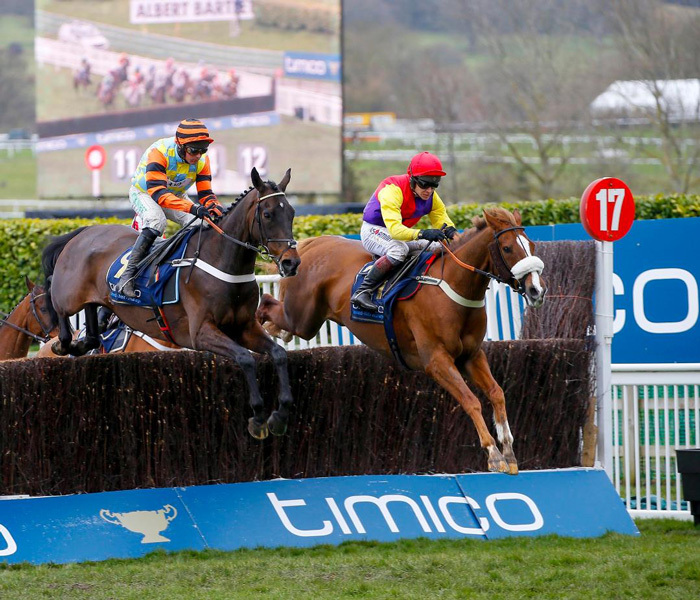 For me, there were two particular highlights, Native River winning the Gold Cup and me winning The Silver Cup for the Economic Security Tipping Competition! Everything has been written by finer wordsmiths than I, but just to state that this years’ Gold Cup epitomised everything that is so admirable about the staying chaser and the fellows who both ride and train them. My judgement and eulogy of this race has nothing to do with the fact that the result of The Gold Cup clinched the tipping contest, the cup and the winner’s cash for me! Like all good winners there is always a price to pay and in this case, it is the winner’s duty to pay for the first few bottles of champagne at what will be the 20th year of this competition next year! This is our most recent arrival into the yard. 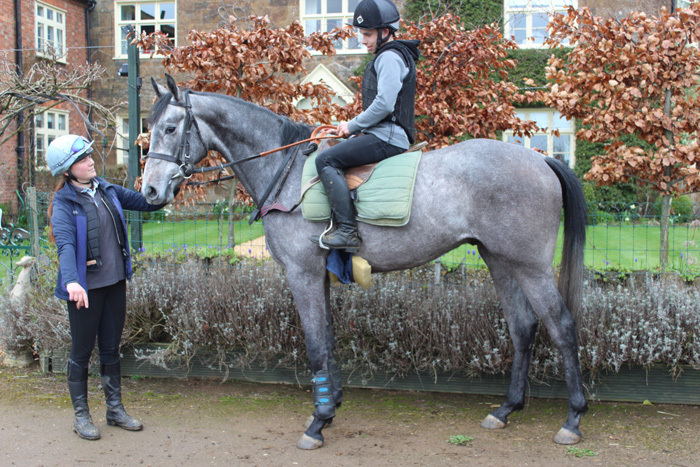 3yo grey gelding by Enrique (sire of Binocular) out of Andria, a Martaline (outstanding French NH sire) full sister to Malaya, who is a dual Listed hurdles winner and won at Ascot two weeks ago for Paul Nicholls. This horse was only quietly ‘broken’ in January and we bought him in Normandy from Guy Petit two weeks ago. He is very athletic and has an excellent temperament. He arrived last Friday and we rode him for the first time two days ago. The plan would be to educate and get him cantering upsides for four weeks before turning him away for a six week holiday. In the Autumn he could start off in a three-year-old bumper or go straight over hurdles. Guy Petit is a very experienced and notable bloodstock agent who has supplied many very good horses to Philip Hobbs and Venetia Williams. He called me about Starjac two years ago and I trust him as a good judge. This horse looks a lovely prospect and needs a lucky and devoted owner! With the doves nesting in box 36 and BBC Weather promising us +20c. next week, we are so hoping that our mud-hating horses will be able to come out of hibernation in the next week. Let us hope they don’t resemble Sue Cook and Ian Sharpe’s tortoise that has just decided Spring is imminent and emerged last week! KERRERA has had the winter off and is beginning to blossom, although like many fillies around the country could benefit from some real springtime warmth. She has strengthened and like most Champs Elysees, should improve from three to four years. We had trouble with her feet last Summer and she was as difficult to keep shoes on as Sandie Shaw. (showing our age!) Her winter break has allowed her feet to grow some good new horn and I hope she will have a good time in staying handicaps. She runs at Wolverhampton this Saturday night over 1 ½ miles and I just hope she doesn’t find the track a little sharp. We cannot wait to run INDEFATIGABLE but have been thwarted by the heavy ground in recent weeks. She was third on her debut at Punchestown in January, beaten just over three lengths by no less a horse that the subsequent Cheltenham bumper winner Relegate! She does everything right at home, relaxed on her own and then gently competitive when upsides. Her coat has been backward but is coming now and we hope to be able to run her at Cheltenham or Southwell next week. Derek O’Connor, a true professional amateur is hoping to continue his association with our “Mary”. We are all saying ‘Hail Marys’ around here. VERY LIVE was a very game second at Fontwell last week, his third second from four starts and possibly bumping into a well-handicapped horse again. We injected his stifles after his disappointment at Lingfield, something we had to do once last year. I hope that he can win before the ground dries up, because as we know when it does it can do so in a matter of days. NEW AGENDA is a fine beast of a horse and has had two runs on the All-Weather to help prime him for a bust Summer when it arrives. His two runs have been perfectly respectable and he is ready to run over hurdles if the ground is ready before the end of this season, or over hurdles, fences or on the Flat in May. GO AS YOU PLEASE is ready and waiting. He has been working well and looks a thoroughly genuine and promising horse. He is by Jeremy, so should manage soft ground but we just did not want him to make his debut on heavy stuff as he did have a little problem back in the Autumn. There are also two other bumper horses that are close to their debuts; watch out for BIG DATA (Oscar 4g) and EURKASH (Irish Wells 4g). CIRCUIT COURT ran much better at Huntingdon, his first start since a hob-day operation but he again needs it to dry up. 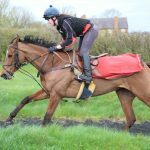 He has great scope and won his point-to-point in Ireland last April on good ground. ROBIN DEUZ POIS looks an absolute ‘picture’ but has disappointed (and got handicapped) on soft ground up until now. We avoided Kempton this week as it got soft on the morning of her race, but look forward to running her asap. ROYAL DEBUTANTE is another praying for drying ground and is ready as soon as she can exit ‘Our Ark’ onto ‘terra firma’. COSMIC DIAMOND is another in exactly the same situation. Both of these will be fresh for extended campaigns through into early Summer. So the wettest and most disappointing Spring is nearly behind us and olive branches and green shoots are appearing. Here we go back to where we want to be.